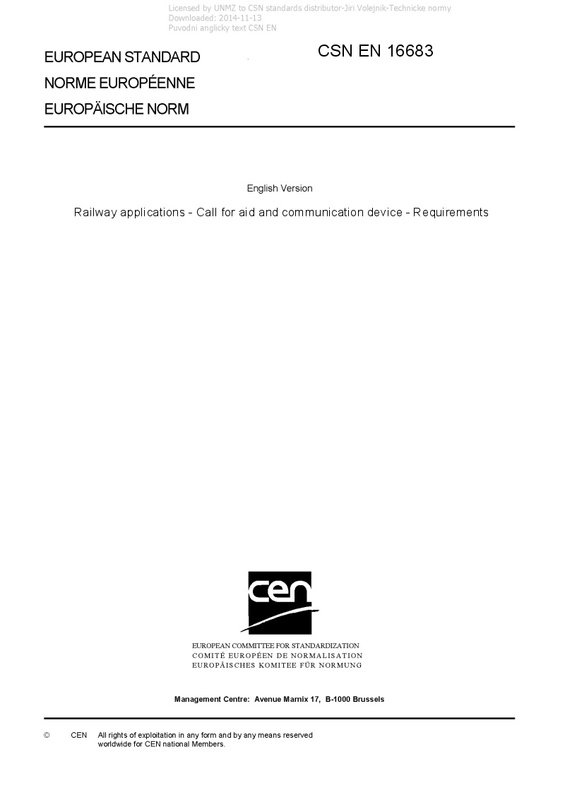 EN 16683 Railway applications - Call for aid and communication device - Requirements - This European Standard specifies the functional requirements for Call For Aid and Communication devices fitted in trains: - the functional requirements for a Call For Aid and Communication device; - the dynamic analysis of the Call For Aid system. NOTE 1 The Call For Aid function on existing vehicles may require modification to work in conjunction with vehicles that comply with this European Standard. NOTE 2 The Call For Aid function is separate from the Passenger Alarm System (PAS), which is provided to deal with emergency situations. The PAS is described in EN 16334. NOTE 3 The communication device is different from the PAS, but it can share some parts of the PAS to achieve its functionalities. NOTE 4 The PAS is regarded as a safety relevant system whereas the CFA and communication device are non-critical aids to passengers.